In 2013, homeowners insurance companies paid on average $698 in claim payments for every insured home in Colorado—58 percent more than the $442 paid on average countrywide. In 2012, insurers paid $936 on average per insured home in Colorado—87 percent more than the countrywide average of $501. Colorado experienced particularly high average claim payments per insured home during the last five years examined. From 2009-2013, claim payments per insured home averaged $804—179 percent more than the average payment per insured home ($288) during the previous twelve years. Much of the increase in claim payments noted above was due to an increase in catastrophe-related experience. From 2009-2013, catastrophe experience accounted for approximately 54 percent of all homeowners claim payments in Colorado. During the previous 12 years, catastrophe-related experience accounted for approximately 26 percent of all claim payments in the state. The frequency of paid homeowners insurance claims, depicted in Figure 2, is the number of paid claims per 100 insured homes. Claim frequency in Colorado was on a general decline until 2009 when frequency jumped to 12.4 paid claims per 100 insured homes. After 2009, claim frequency in Colorado resumed its general decline, but has remained above the countrywide average every year except 2011, when it was essentially the same as countrywide. The extreme volatility of homeowners insurance claim frequency in Colorado over the 17-year period examined was due almost entirely to catastrophe-related experience. Claim severity, depicted in Figure 3, is the average payment per paid homeowners insurance claim. The average severity of homeowners insurance claims in Colorado grew from $2,208 in 1997 to $11,331 in 2013—an annualized increase of 11.8 percent per year. In contrast, average claim severity countrywide grew at an annualized rate of 7.8 percent per year. For the same period of time, inflation averaged 2.4 percent per year. The rapid and continuing increase in the severity of homeowners insuance claims has multiple causes, including an increase in the size and complexity of new homes, the increased severity of storms, and major increases in the peice of oil-based building materials such as asphalt or tar roofing. Experience from the most recent five years (2009-2013) suggests that catastrophe-related losses may have grown in significance relative to total claim payments. Figure 4 illustrates the percentage of total claim payments attributable to catastrophe events by insurance companies for the years 2009-2013. 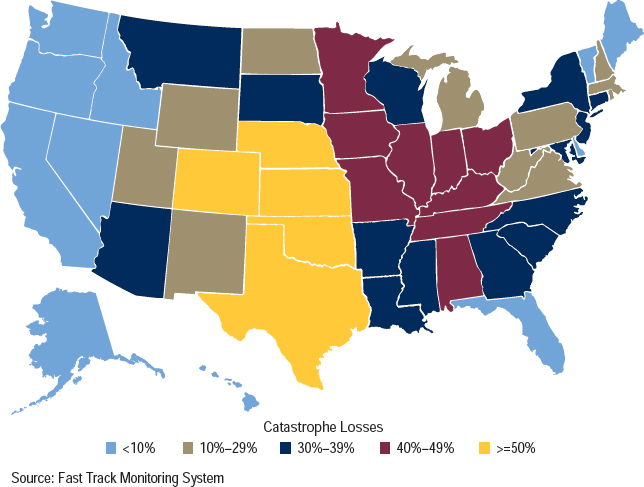 In 14 states, catastrophe-related claim payments accounted for 40 percent or more of total claim payments. In five of those states, (Colorado, Nebraska, Kansas, Oklahoma and Texas), catastrophe-related claim payments accounted for 50 percent or more of all claim payments. *Source: This analysis is based primarily on data reported by insurance companies participating in the Fast Track Monitoring System. The Fast Track system is a cooperative effort of three major statistical agencies, ISO Data, Inc., Independent Statistical Service, Inc., and National Independent Statistical Services. Insurance companies participating in the system represent approximately one half of the homeowners insurance market countrywide. The findings presented here were previously published in the IRC report Trends in Homeowners Insurance Claims, 2015 Edition. More information about the data and methodology can be found in the report.